1) Using the (Tools > Add-ins) dialog box. 2) Copying the add-in to your xlstart directory. 3) Copying the add-in file to your "at startup, open all files in" folder location. 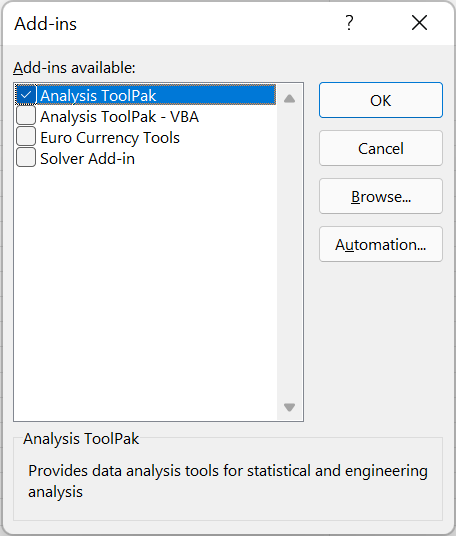 Defined by (Tools > Options)(General tab). 4) Double clicking the add-in file or using the (File > Open) dialog box. You can also drag an add-in into a session temporarily to load it until you close that session. Any add-ins loaded using this method are not displayed in the (Tools > Add-ins) dialog box. 5) Using a Startup Switch. Browse - Displays a dialog box allowing you to browse for an additional Excel add-in. Automation - Displays another dialog box that lists all registered Automation servers available on the system. If the add-in you want to install is already in the list then tick the corresponding check box. Press "OK" to install this add-in. Any changes made to the loaded add-ins are not saved until you actually close Excel completely. If the add-in you want to install is not in the list then you will need to browse for it. Press the "Browse" button to display he Browse dialog box. Once you have found your Excel add-in (".xla" file) press "OK". If you are browsing to an add-in that is not saved on your local C drive then you will see the following message as soon as you press OK asking if you want to save a copy of this add-in locally. You should always select "No" to prevent saving multiple copies of the same add-in. Press NO and then your add-in will then be added to the list (in alphabetical order). Make sure that the check box is ticked and then press "OK". It is possible to open an Excel add-in using the (File > Open) dialog box or by just double clicking on the file in Windows Explorer. This will open the add-in as a regular workbook however you will not see the workbook because all the worksheets are hidden. The add-in however is not installed and willl not load the next time you open Excel. If you double click an add-in (in Windows Explorer) or open it through the (File > Open) dialog box, the add-in is loaded but is not properly installed. The add-in will not be available the next time you open Excel. Be aware that the more add-ins you have installed the more memory is needed and the longer Excel will take to open. It is worth uninstalling any add-ins that you do not use. It is also possible to always load an Excel add-in without using the (Tools > Add-ins) dialog box. Add the following to the Excel application switch path, e.g. /LS:\Personal\Excel\Automation\Useful.xla (note no speech marks). If you saved your add-in in a folder that is different to the default "Add-ins" folder then you will be prompted with a message asking you if you want to make a copy of the add-in and save it in the default add-ins folder. This is only applicable to Excel 97.